Do you know which industry is the biggest benefactor of bad roads and increasing traffic in India? It’s the ecommerce Industry. Nearly 76 percent of the respondents from ASSOCHAM survey said that they find it much easier to do shopping from the comfort of your own desk or smartphones or tablets to type out a search phrase and click “buy” than have to undergo a mall excursion. And when it came to online shopping, Delhi people beat the rest of cities in India. Over 67% Delhiites prefer online shopping over the regular shopping with available deals online than in brick and mortar. Mumbaikars (60%) came in second, Ahmedabad (52%) third and Bangalore (50%) fourth in their preference for online shopping. The survey pointed out that shoppers are increasingly taking the online route to escape worsening road traffic, increasing fuel prices and lack of time. Another interesting find from the survey was that nearly 20 to 25 percent online sales is now being generated by mobile devices, an increase of around 10-15 percent compared to last year. 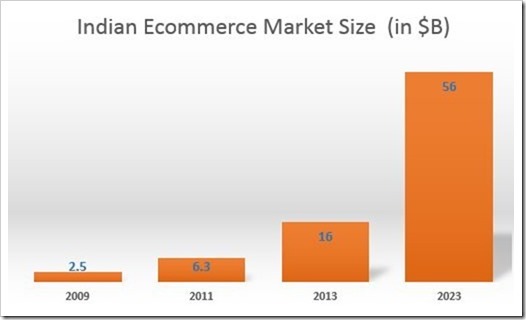 There is a reason why VC’s are pouring in big money into Indian ecommerce space. The e-commerce market stood at roughly $2.5 billion in 2009, it went up to $6.3 billion in 2011 and to $16 billion in 2013 and is expected to touch whopping $56 billion by 2023 which will account for nearly 6.5% of the total retail market. 55% respondents shop online during lunch hour or during closing hours. Fasted growing age group that shop online are between 18-25 years. Among existing shoppers, 35% are in 18-25 age group, 55% in 26-35, 8% in 36-45 and 2% in the age group of 45-60. 65% of Online Shoppers are male as against 35% female. While convenience of shopping online is one of the main reasons, some of the other reasons why Indians are increasingly shopping online are product availability, good discounts, detailed product information, product comparison and saving of time! The survey ranks Flipkart, Amazon and Myntra as the top 3 ecommerce players in India, followed by Shopclues, Dominos, Freecharge, Jabong, Tradus, eBay and Snapdeal. It is interesting to see Snapdeal ranking so low, as in terms of Sales they are probably second largest after Flipkart.